Test your Senior Certified Professional knowledge using our SHRM Senior Certified Professional (SHRM-SCP) Premium Practice Exam and be assured of your readiness for the SHRM-SCP certification exam. This practice exam validates your learnings with a set of refined and recently updated questions which will improve your subject knowledge and help you identify the areas of improvement. With the purchase of this product, you will get unlimited attempt practice access to the following premium practice exams for 2 months. The SHRM-SCP Questions Bank contains 255+ Questions, our premium SHRM Senior Certified Professional certification practice exam populates questions randomly from this question bank. All the questions of premium question bank will be easily covered in 4 to 6 practice exam attempts. 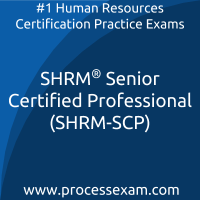 However the more you practice, the best will be the result in actual SHRM-SCP exam.